Here is a quick side dish before the movers come and pack everything we own into a container and send it off to sea and us into between homes limbo… with heavy suit cases stuffed with light clothing for our last weeks in sunny cali and down jackets and boots for cool Copenhagen. Prepare the veggies by cutting them all about the same size. 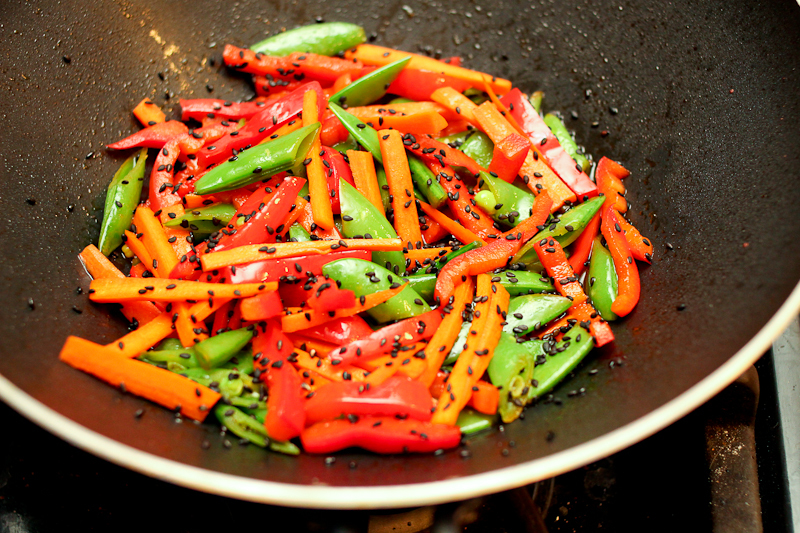 Fry veggies 3-4 minutes in the soy sauce and sesame oil. Sprinkle with the sesame seeds and serve. The veggies should still have a bit of crunch. This entry was posted in Asian inspiration, Salads & sides, Veggies only and tagged asiatiske grøntsager i wok, quick asian side dish, sugar peas with soy sauce, veggies with soy and sesame. Bookmark the permalink.